Well, you get what this film actually stands for : fantastic action, embellished with fighting scenes, infused with terrible acting, a wafer-thin story and lots of not so funny one-liners. If Arnold Schwarzenegger makes one more “I’ll be back” joke, I hope they shoot him in on the spot. That’s what the Expendables are anayway. 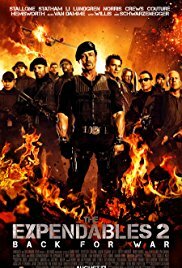 A collection of old legends whose action movies I’ve enjoyed during the last 20 years. They are the founders of the action genre from the 80s. The idea to collect them in 1 film was original, but with this 2nd film I start to get a “yes-we-know-it-and-we-have-seen-it-before” feeling. The best parts were reserved for Bruce Willis and Sylvester Stallone. The rest is just needed to fill up the cast. But in the area of action, they are the crème de la crème. Chuck Norris is magnificent and refreshing. Am I waiting for part 3 now ? Nope, not really. But on IMDB I see there’s another one in the making … but without Bruce Willis … Oops ! With a few newcomers like Nicolas Cage, Mel Gibson (rumored) and Wesley Snipes.